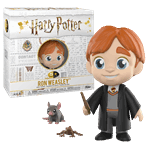 Second-youngest Weasley and best friend to Harry Potter, Ron Weasley is much more than just a friendly sidekick. Along with Harry and Hermione, he helped keep He-Who-Must-Not-Be-Named from the last known Philosopher's Stone, rescued his sister Ginny from the Chamber of Secrets, formed Dumbledore's Army and fought in several battles, and hunted for Horcruxes to destroy. He did all this with little more than magic, luck, and some impressive wizard's chess skills. Funko is thrilled to dive deeper into the world of storytelling and pop culture with their latest line of collectible vinyl figures – 5 Star! Up first we have your favourite characters from the world of Harry Potter, which have been uniquely brought to life once again with the 5 Star treatment. 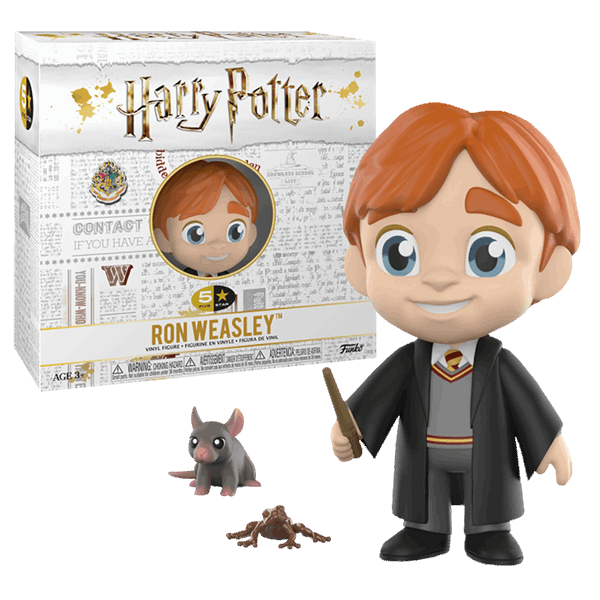 Standing 4" tall, this vinyl figure features Ron Weasley, dressed in his Hogwarts robe and holding his wand. He comes complete with his Chocolate Frog and his beloved pet rat, Scabbers.